Did you know from the beginning that there was 3 books' worth of material in Bunyip Bay? Wow! So you could keep going on a never-ending thread like that, I suppose. I totally agree with what you say about sequels, that's what I tell my readers when they ask for more – don't you think they've been through enough? But the way you're doing it gives you the opportunity to draw on a huge 'cast' of characters, and give them each a fresh story. Now, I find it so difficult when people ask me what's my favourite book, but I'm going to ask you anyway – do you have a favourite couple in the trilogy (or is it a quadrology now)? Ooh favourite couple. That is a tough question. Like choosing a favourite child, it really depends on the mood I’m in – lol! 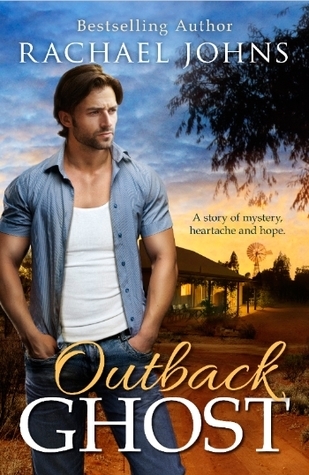 But if you’re going to make me pick, I’d have to say Adam and Stella from OUTBACK GHOST. Adam has been with me from the start of the series as he was a friend of the characters in the first book, so I’ve learnt a little bit more about him in each book and I was SO ready to give him his Happy Ever After. He’s had a horrible experience that shaped his past and who he is today so it took a really special woman (or rather women, if we include the heroine’s little girl) to help him heal. Stella is a young woman who has also had a hard life so far but she’s never let anything defeat here. I think they’re a match made in heaven and it was fun to go along for the ride as they fell in love. Yes, it's often the latest couple who are closest to your heart. And I'm sure your readers will agree about Adam and Stella! But then, they're not quite your latest, are they? I really have lost count of how many books you have either written or are writing this past year - you're prolific! I shouldn't be highlighting this for my readers, who are always asking when my next book is coming, and I'm afraid a year apart is close for me. So how do you do it? Especially with three young boys under your feet? Haha, I ask myself this question a lot, cos most of the time I barely feel like I’m keeping my head above water, never mind getting any words down but it’s amazing how those words really do add up. In theory I work school hours now and that’s when I do the majority of my writing. But school carnivals come up, kids get sick, other things make me lose days, so I also write most weekends for at least a couple of hours each day and I make lots of other sacrifices. Like ironing, and housework :( And I’m not much of a cook anymore, but hey, my kids are so fussy, they don’t want to eat anyway. I don’t watch much TV either, although this is something I regret and want to change. I’m not a superwoman, I just set myself goals and I don’t always achieve them but I find if I aim for a certain amount of words per day, I’m more likely to get there than if I don’t! Well, maybe you are a bit of a superwoman! I hope your readers appreciate the sacrifices you’re making – ironing and housework, however do you cope? :) But clearly it’s working for you. I have just received your newsletter with the announcement of your latest novella, THE NEXT SEASON, which follows on from THE KISSING SEASON. What other goodies do you have in store for your readers? Thanks Dianne – those novellas were a lot of fun to write. I really enjoy writing a short story between the big books and THE NEXT SEASON is a first-lovers reunited story, which happens to be my favourite type of romance of all!! Following THE NEXT SEASON is THE ROAD TO HOPE, which is linked to my first rural romance JILTED and will release in March next year. This was a fun and challenging story because I took a character who wasn’t very nice in JILTED and made her the heroine in THE ROAD TO HOPE!! Can’t wait to share Lauren’s story with all my readers! Thanks so much for the chat, Dianne! I can’t wait till the next time we can do it in person!! Look forward to that, Rachael!